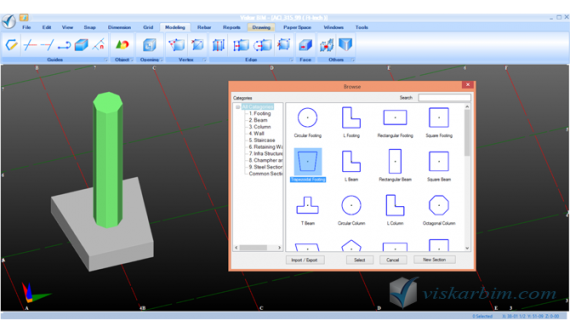 A SIMPLE, EASY-TO-USE BIM MODELING SOFTWARE FOR TODAY’S CONSTRUCTION INDUSTRY. 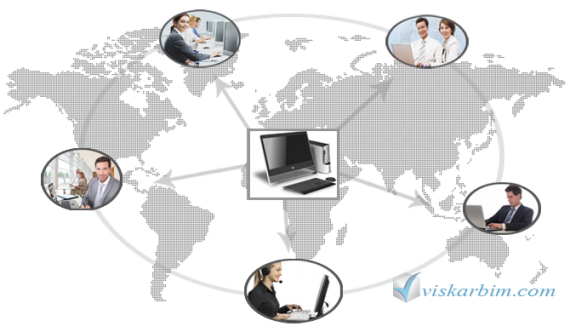 Bring Teamwork, Transparency And Control To Your Projects Using VISKAR CLOUD. 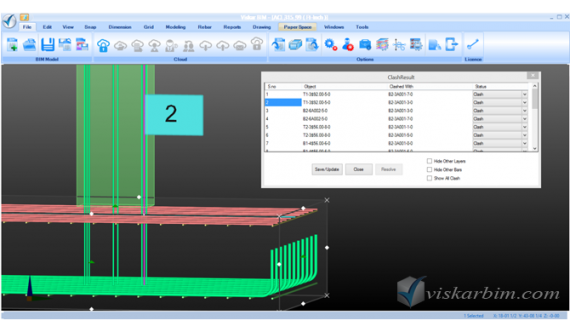 VISKAR BIM provides easy options to collaborate with your teammates online. Collaboration brings much-needed control to projects, and keeps everyone informed on live project status. Errors identified in earlier modeling stages are easy to fix and will save time. 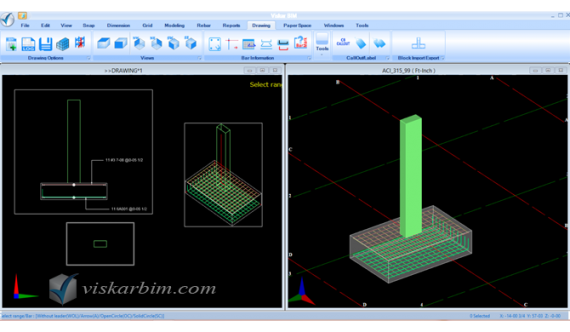 While one user is modeling concrete, another can model rebar and one more can generate drawings. All three users can be sitting in different time zones around the globe. Custom class creation for each material. Custom property creation for each material. Custom property creation for each class under each material. Ability to set formulas for custom properties. 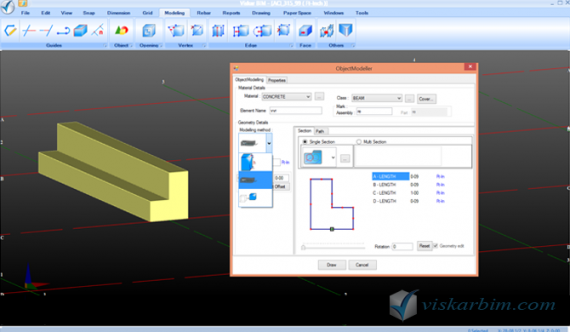 Custom developed CAD Engine, considering the voluminous modeling requirements. Carefully blended 2D and 3D options. Refined algorithms for faster object manipulations. Industry Foundation Classes (IFC) facilitates model sharing between existing BIM Applications. IFC import and export (2x4) is supported. IFC import also supports IFC property updates, which is useful if you need to import IFC models for updating. 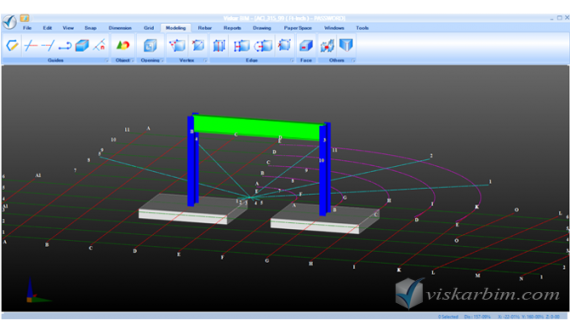 VISKAR BIM has flexible options to draw grids - supports cartesian and cylindrical coordinate systems. Custom grids can be created using horizontal, vertical, radial and circumferential grid lines. Grid systems and grid lines can be copied, arrayed, moved, deleted, inserted in-between, etc..
Standard grid views are automatically created and the user can select one or more grid view in multiple view ports. Grids can be switched off, if not required in a project. Guides are basic 2D shapes - line, rectangle, etc. 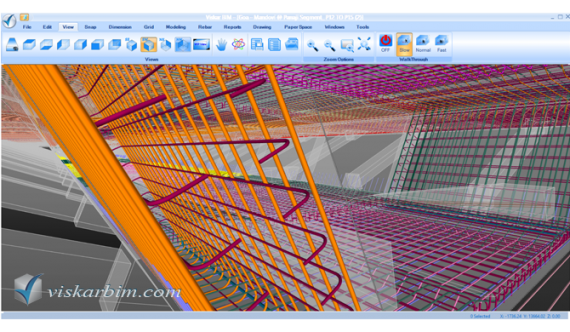 VISKAR BIM supports drawing poly lines, rectangles, circles, arcs, etc. Guides are used to create closed sections - extrude, sweep, etc. - which are used by various modeling methods to form 3D objects. Geometric edit, trim and extend options provide ability to create desired sections. VISKAR provides three different snaps - grid snaps, guide snaps and object snaps. Snap tools like ortho on, ortho track , etc. provide additional benefits. Snaps can be switched on and off to facilitate a precise point selection for various modeling operations. Access to predefined 2D sections library. Supports adding new 2D sections to library. 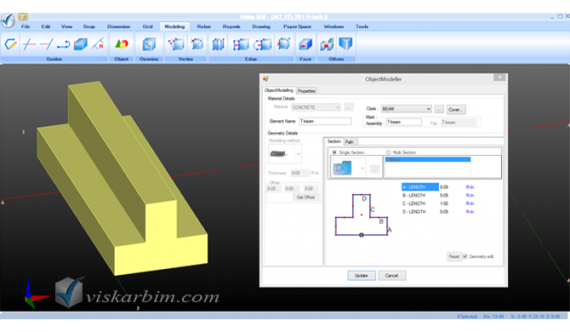 Supports setting formula and shape/length validations for 2D sections. Sections can be stored under different categories for easy access. 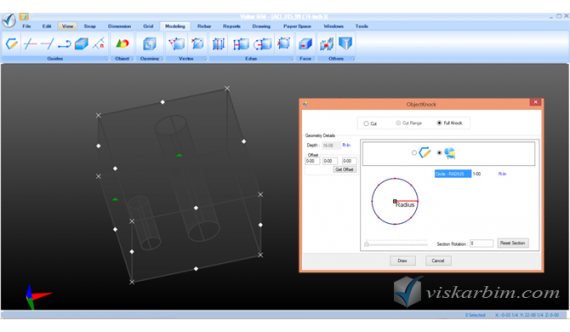 Ability to set thickness for tubular sections. Access multiple profiles of the same section. Add different profiles to an existing section and create a new catalogue. Set non-geometric properties to sections used in the catalogue. Supports importing profiles and values from a comma separated text file (CSV). Quick modeling of solid and tubular objects from predefined Objects Library. Add new materials like wood, aluminum, etc. Supports adding new parametric objects to Objects Library. Pre-defined sections from Sections /Catalogue Library. Custom drawn section by the user. Closed polylines in imported DXF file. Supports multiple sections to enable object transitions from one shape to another. Path points defined in a table of X,Y,Z as relative coordinates from an insertion point defined by the user. Closed 3D Wireframes formed using lines and plines converted as a 3D object. A 2D section can be revolved at an angle to form 3D objects. 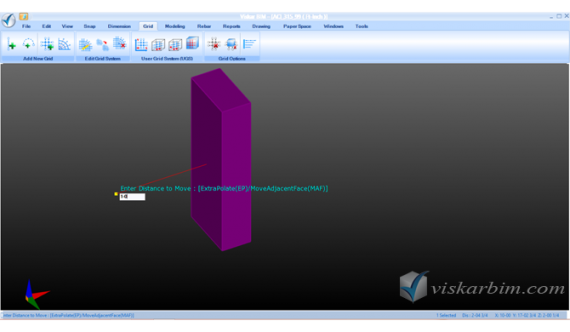 VISKAR BIM uses the proprietary "Object Retention Algorithms" to ensure that any edit to an object is allowed only if the output is an "object". Add edge to surface of the 3D object. Modify - line edge to arc edge. Objects modeled using profiles in catalogue. Objects modeled using sections where "Geometric Editing" is disabled. Height of all the objects formed using extrude method can be modified. The path of an object formed using object - sweep - draw path can be modified. Sections / Profiles can be changed. Properties of a section can be modified. Extrude direction, alignment points, offsets, rotation, etc. can be modified. Material cannot be changed once modeled. Class name, element name, etc. can be modified. Supports modeling multiple cuts /openings/chamfers on an object. Cut objects can be modeled using 2D sections extrude or sweep methods. Pre-defined sections from Sections/ Catalogue Library. Existing closed polyline on the face of the object. Rectangular, polar, polar rotated array. Assign properties to multiple objects (multi-object editing one go). Area - gross surface, net surface, top, bottom, side. Volume - gross volume, net volume, volume of openings/cuts/chamfers. Geometric properties – number of faces, edges, vertices, size, grid reference, etc. 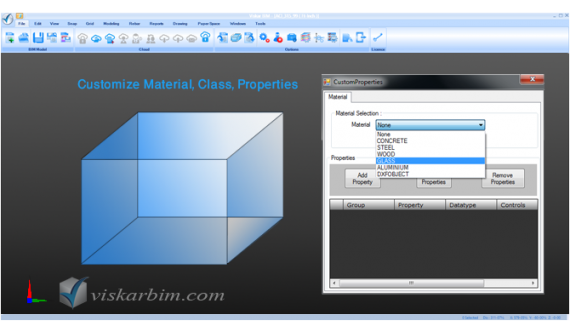 Custom properties created for the material and class will also be displayed. 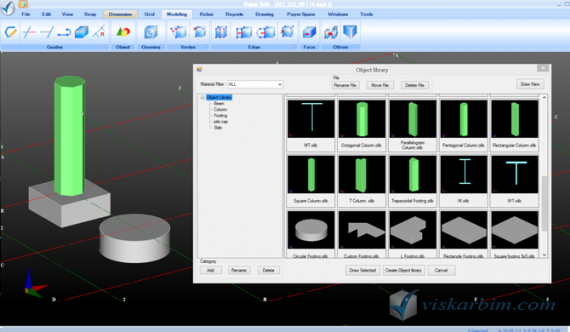 Multiple objects can be selected and clashes can be identified. Clashes numbered and flagged for easy identification. Clash objects can be cut or modified. Identified clashes can be saved for periodic checking and resolving. 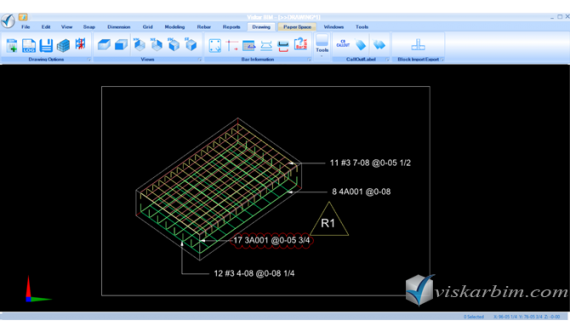 VISKAR BIM has a user-friendly Reports Wizard that can create impressive, customized reports. However, VISKAR also comes with standard reports for concrete estimates, bar bending schedule weight summary, steel bill of material, etc. Industry standard reports are company customized and available with installation. User can customize the reports using all the properties provided. Custom properties are also included in the Reports Wizard. Reports can be printed in standard sheets or can be placed in a drawing like a bar bending schedule. As the model changes, report contents are automatically updated in the drawing. 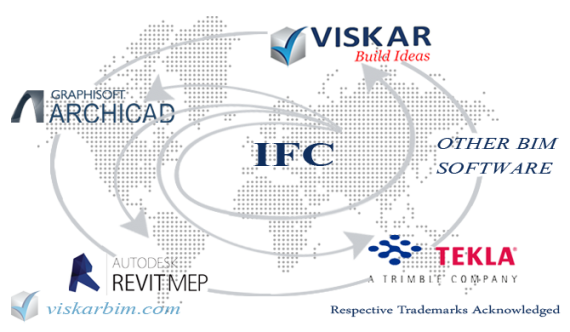 VISKAR BIM provides an easy-to-use interface for creating construction drawings that follow different country standards and industry practices. Framing plans can be inserted to scale. 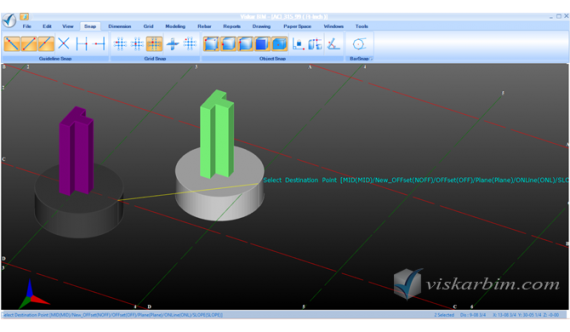 Object views can be placed to scale- plan, elevation, left, right, isometric views. Framing plan/object views, etc. can be dimensioned. Object marks can be placed. Number of occurrences of each object can be placed under each object view. 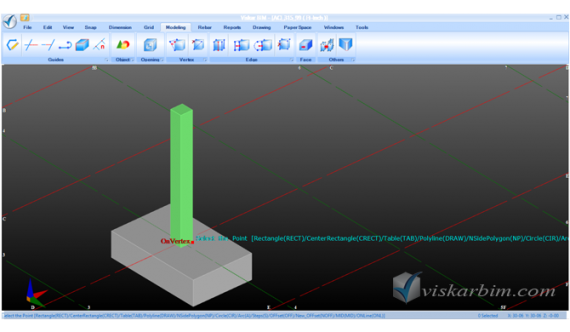 Selected rebar can be shown in framing plan or object views. All bars / bar in range can be shown with callout or label. Reports like bar bending schedules or placing lists can be placed for all or selected objects. 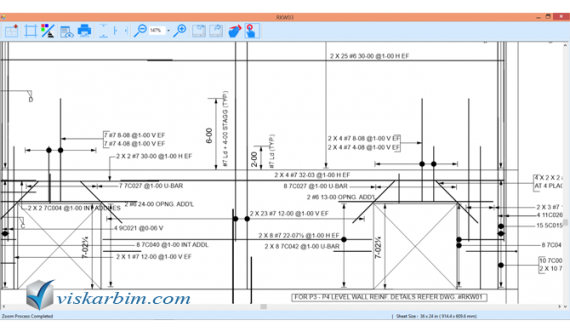 Predefined blocks, like typical sections, can be placed. 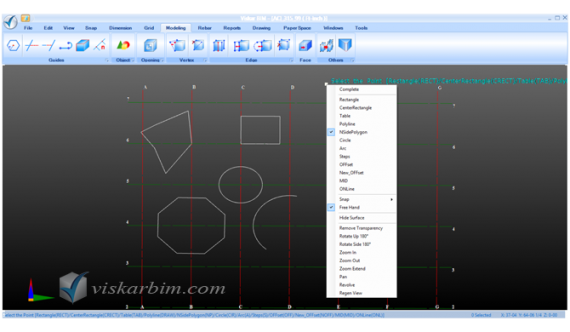 Users can create new blocks using guides or can import DXF files and create a Library of Blocks. Blocks are very useful and can be placed as typical sections. Drawing is a view from the model. If the model changes, the drawing will change. A notification will be placed against each drawing and the user will be prompted about the change. Revision numbers will be automatically placed on the drawing to indicate the changed objects. Any reports placed in the drawing are also updated automatically. Layouts/ Paper Space - create sheets in your title block. The title block can be created and stored specifically for each company. The required title block is placed in the layout editor. Required views and reports are linked to this from drawings. In just a few minutes, the construction drawings in the company’s title block are ready. 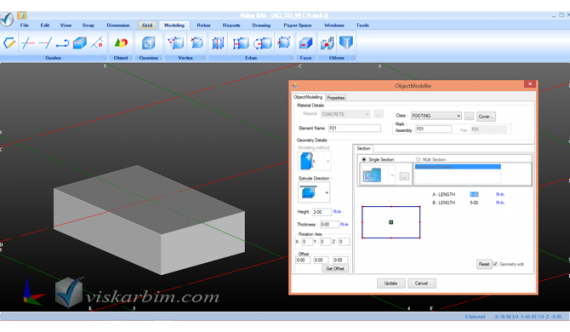 CNC Bar list - Take off from model & transfer to your production software. 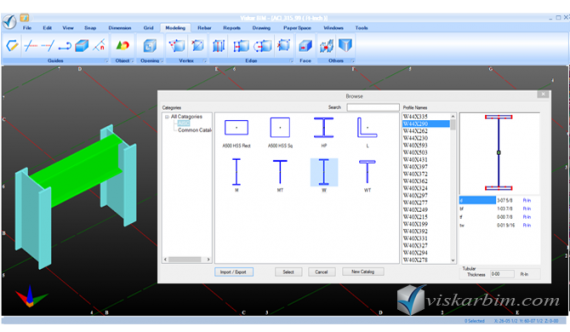 VISAKR BIM provides "the fastest way to detail rebar that is practically error-free". Rebar detailing is automated using proprietary "Rebar Detailing Intelligence." When typical rebar sections are applied to different concrete objects, they are automatically detailed to suit the surface and contour of the concrete object. The proprietary "Surface Recognition Algorithms" play a major role in automation. Typical rebar sections available in library for commonly used elements. 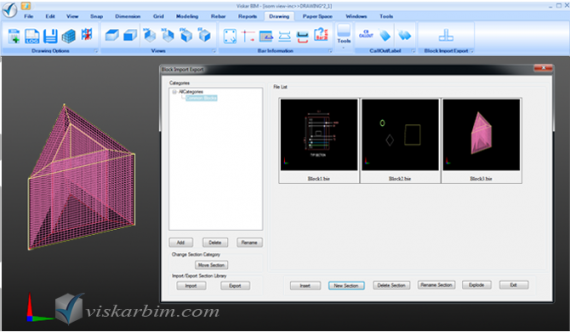 Rebar sections automatically recognize the following and auto detail. Rebar is automatically adjusted for modifications made to concrete objects. Rebar automatically adds cuts for openings, and joins if openings are deleted. Automatic lapping to stock, shipping and mill lengths or to specific locations. Supports normal lap, crank lap and alternate staggering. Various other useful parameters to adjust lapping to suit project requirements. Normal bars, bundled bars and ties can be modeled. Rebar hook values, bending values, etc. are automatically calculated as defined in the program. Rebar properties can be changed for a whole set, for a run or for a single bar. Rebar can be modeled from scratch in concrete and stored as a typical section for reuse. 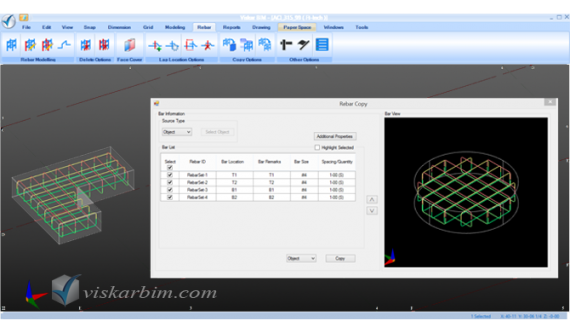 Rebar modeled in one element can be copied to another element of a different shape. 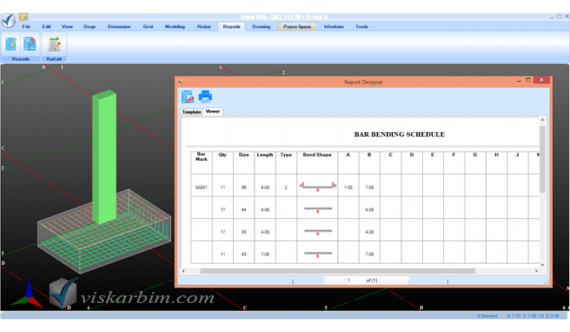 "Apply properties" can be used to change the properties of selected rebar in one step. “Point bars” option is given to model free rebar that are not affected by concrete object geometry, but are still associated to it.